Buy photo and text printed cushions online from dezains.com. Wide range of templates you can customise based on relationship and occasion. Buy these cushions online now! Everyone likes to decorate their houses with beautiful items. One of the favorites among these items are personalized cushions. Cushions could be placed on the sofa or on the bed. So, how about bringing variations to these cushions? They could also be personalized and fit for gifting on various occasions. If you like the idea, then dezains.com is the place you should head for. They have the most unique gifting ideas. They have transformed the cushions into something quite personalized and interesting gift items. There are nearly 50 items to choose from. You can gift these on any occasion. Valentine’s Day to Diwali: every type of festivals could be attended with such gifts. One of the most embraced things in a house is a cushion. Whether you are watching TV, just lying down, or missing someone while trying to hold back tears, a cushion is a thing you turn to for comfort. Now imagine the cushion having the name or photograph of your loved one. How good would it feel! Printed photo cushions are one of the most important things in the drawing room as well as in the bedroom. When you gift a personalised cushion for someone to keep in their bedroom, it reminds them of the time you spend together and the beautiful memories you shared. They represent the delicacy that is present in the personality of the recipient and also displays how the other person is so important to you. It is a good idea for couples who are in a long-distance relationship. Gifting your significant other a personalized cushion adds an element of spice and passion. It also reflects the affection that you have for the other person and can be considered as a token of your love. Nowadays there are legitimate online stores who seamlessly incorporate the text and images of your choice on the cushion. You can add a favourite quote of your loved one or add some text to show how much they mean to you. All you need to do is provide the necessary details and the store will provide you with nice printed personalized cushions. The sweet moments that occur in a person's life are worth visiting back every single time. When people who are too close to our hearts are not around us, we need something that can make us feel their presence for all time. Therefore in order to retain the bonds and the emotional ties we have formed, we need to have something that can make us feel loved throughout even when the person who makes us feel this way is far away. We all strive to make our homes as beautiful as possible. So how about making helping your mate enhance their decor by gifting them personalized cushions that are soft, beautiful, and vibrant? This way, along with making that person feel loved, the cushion will also enhance the decor of the place and make your partner feel even better. It also acts as a reminder of the beautiful intimacy two people in love share. A cushion is a form of an adorable keepsake that the receiver can cherish for a long time. 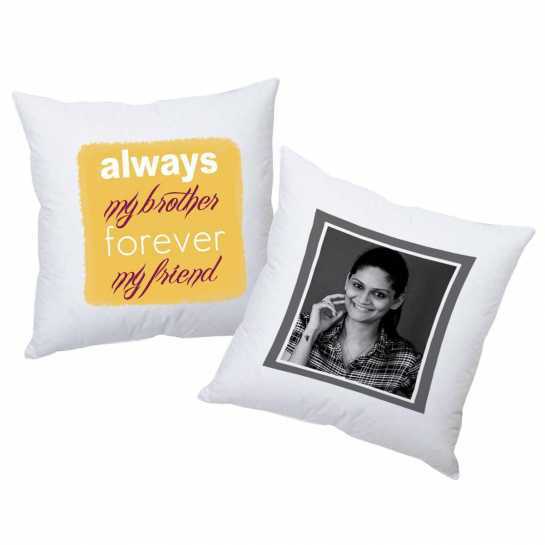 Therefore, buy online customized cushion if you are looking for a perfect gifting item. A personalized cushion can be considered as a gifting item when you are about to commemorate a joyous moment or occasion or surprise your loved ones with gifts that are beyond their imagination. Such a gift calls for a proclamation of love and is preserved forever. Even in your absence, your loved one will have a sense that you are still around. The way they will feel when they look at your gift will be gratifying. You can also relive a moment of happiness that occurred sometime in the past with the help of personalized printed photo cushions. You can fill the blankspaces up with heartfelt quotes and messages along with some pictures that represent a meaningful point in your lives. There are many fonts and styles from which you can get the written matter printed. Similarly, there are many styles in which the photographs can be printed such as black and white, grayscale, colored, etc. The best part about gifting someone with printed photo cushions is the immense variety that is present. You will never run out of ways to get the cushion customized. There is somethingunique for everyone, an idea that best describes the personality of the other person. Therefore, you have a wide array of options to choose from. In order to greet the people you love on an occasion that is special to both of you, there is a great variety of personalised cushions available online. The images that the aspirant purchaser provides are printed on the cushion and the results are beyond appreciation in words. Another great idea is to use the initial at the centre of the cushion as a hologram. Along with the printed photographs and quotes on theprinted photo cushions, the hologram will impart a creative touch to the entire cushion. The day a person gets married, the day they are born, the day something special took place are important ones in the lives of people. When you get these moments printed out on something as adorable as a soft and comfy cushion, a wave of excitement runs down the receiver's mind. When two people in holy matrimony are beginning to embark on a new journey together, the one thing that keeps them determined that they can do it is wishes from their loved ones. You can also gift these cushions to a couple who is getting married with their pre-wedding pictures printed on it along with a message that wishes them all the best for the new life they are about to start together. One great example of gifting a photo cushion is on the day of a couple's marriage anniversary. A husband can giftpersonalized cushionsto his wife or vice versa. Even another couple can give it to them as a token of their best wishes for years to come. A person clicks the best pictures on his or her wedding day. Therefore, there will be no shortage of pictures to be printed on the cushion. Valentine's Day is a day of love. What better way could there be to express your love than gifting your loved one a beautiful personalized cushion with pictures and quotes that describe your bond! Want to have your and your boyfriend’s name written on the cushion? Just send in the names. Even if you send in your pictures, those will be graphically imprinted on the cushion. You could also propose to your girl with a ‘would you be my valentine’ personalized cushion. That will be an amazing idea. You can also go for a baby pink personalized cushion with a heart staffed on it. Diwali cushions have the best variations. Starting from Diwali messages to graphical representation of crackers and fireworks, everything is available on those cushions. Get your photo or text on cushion. Brothers and sisters could be gifted beautiful cushions on Rakhi or on their birthdays. There are very good designs along with personalized texts on those cushions. All these cushions come at a very affordable price. So, you can order any item any time. Ask all your friends as well to check these cushions and but their favorites only on dezains.com.